I think everyone, including all A&P students, should be up to date on the major concepts of genetics and genomics. In most A&P courses, we don't have much (if any) time to cover the basics . . . I think most of us just assume that they've picked it all up in their prerequisite course(s). Or maybe simply by osmosis? The way I handle it is to cover some of the basics in the section on molecular genetics when we cover cell structure and function. But a lot of it I cover in "extra credit" assignments over the course of both semesters. The current (revised) edition (called the "P.S." edition) has been out a few years now, but still retains its up-to-date quality. It's meant as an introduction to genetics and genomics for the general reading audience but it is a perfect way to introduce beginning A&P students to the principles that they will need to know as they proceed through their training and into their professions. Each of the 23 chapters looks at one of the pairs of human chromosomes. Each chapter does not discuss the whole chromosome. Instead, Ridley picks out one or two essential principles that the structure or function of that chromosome can be used to illustrate. 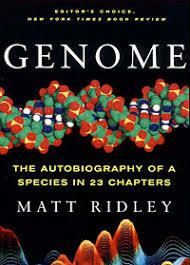 Not only is Ridley able to explain the central genetic principles in an easily understood way, he is also able to do it mostly through stories rather than dry, technical descriptions and definitions. If you haven't read it yet, you should. And if you haven't figured out a way to get your students to read it . . . well, then try my method. I give them additional points toward their course grades for reading the book and answering online test questions about each chapter. I ran across this crazy and interesting blog the other other day and thought I'd share it with you. It's called Street Anatomy and it "obsessively covers the use of human anatomy in medicine, art, and design." It has some fantastic, gross, insane, and interesting examples of human anatomical art that you might want to use to spice up your classroom presentation. Way back in January I told you about my blog to assist A&P students as they struggle through the course . . . The A&P Student. Well, as many of us begin a new academic year, with all new students, this might be a good time to remind our students that they CAN find shortcuts and tips for success if they look for them . . . and an easy place to look is The A&P Student blog. You are welcome to link to the blog from your online syllabus, your course webpage (including Blackboard, Angel, etc. ), or post it on the classroom bulletin board. Please pass the information along to your students and colleagues. You are welcome to link to the blog from your online syllabus, your course webpage (including Blackboard, Angel, etc. ), or post it on the classroom bulletin board. To help you help your students, I'm offering some FREE "anatomical eyeball" bookmarks for your students! While supplies last! The bookmark is a whopping 2" by 7" printed on thick card stock—not one of those wimpy little bookmarks others give away. On the obverse side is an anatomically correct rendering of an eyeball in its bony orbit on the (anatomical) right and the eyeball partly covered by the palpebrae (lids) on the left. When you distribute them to your class, you might even take the opportunity to quiz them on anatomical directions (anatomical left and right vs. the viewer's left and right) to hone some skills, eh? The reverse side contains information about The A&P Student blog. The blog is mainly aimed at undergraduate college students but is also useful for high school students and even students in professional studies (medicine, allied health, etc.). Just email me at kevin@theAPprofessor.org and tell me how many packs of 50 bookmarks you need for your class. And tell me where to send it (it MUST be a school address). A recent article in ScienceDaily discusses a new article in the Journal of Evolutionary Biology regarding the evolution of the human appendix. As you know, Darwin thought that the vermiform appendix was a vestigial, nonfunctional structure "left over" from our evolutionary past. And if you been using my A&P textbooks for the last ten years or so, you also know that biologists have long suspected (and recently confirmed) that the appendix is no such thing. Its function is to incubate intestinal flora (gut bacteria)—which helps keep the ecosystem of the gut in a healthy balance by repopulating the colon with beneficial bacteria after an illness or other disturbance. The new journal article, written by some of the same researchers involved in the most recent confirmation of the "incubator model of the appendix," tackles the evolutionary aspects of the appendix. Evolution Of The Human Appendix: A Biological 'Remnant' No More. ScienceDaily Duke University Medical Center. 21 August 2009. Click here for a FREE surgical photo of a human vermiform appendix. I don't know about you . . . but I sometimes have the chilling thought that I will someday awake from an unconscious state in an emergency room somewhere and one of my former students will be smiling at me and say, "don't worry Kevin, I'll be taking care of you" . . . and it's someone who failed my class because they couldn't tell a femur from a fibula. So I guess that now's a good time to remind ourselves why we are sometimes as hard-nosed as we are about our students know their stuff (and spelling it correctly). Because someday, they'll be posting things to OUR medical records and they'd better not be typing in perineum when they mean peritoneum! This just in from the National Center for Case Study Teaching in Science . . .
HIGH SCHOOL TEACHERS - A new “mini” track made up of three sessions on Saturday specifically designed for high school science teachers (though others, we think, will find it of interest too!). Our break-out session leaders are Richard Donham, Senior Policy Associate, Mathematics & Science Education Resource Center, University of Delaware, and James Serach, Aldo Leopold Chair for Distinguished Teaching of Environmental Science and Ethics, The Lawrenceville School. CLICKER CASES - A new “mini” track on what we call “clicker cases.” We have been getting a lot of questions about how we are using personal response systems (aka clickers) with case studies to create rich and student-active learning environments in large introductory science courses (though the method works well in any size classroom!). There are three sessions in this track, which runs on Saturday. Our conference will be led by Dr. Clyde (Kipp) Herreid, SUNY Distinguished Teaching Professor and Director of the National Center for Case Study Teaching in Science. The conference is open to anyone interested in science education including high school teachers and international teachers. See below for a full listing of the conference sessions and other information. Our conference also includes a poster session and we would be pleased if you submitted a proposal. Register now for this exciting 2-day Case Study Teaching in Science Conference, which takes place on September 25th and 26th, 2009. Early-Bird two-day registration until September 1, 2009 - $450.00. One-day Saturday-only registration is $350. Can a borrow a cup of copernicium? Last month, I gave you the heads-up on the newly confirmed element 112. Now, we have a proposed name for it . . . Copernicium (Cp). An eponym for the 16th-century Polish scholar Nicolaus Copernicus (pictured)—the guy widely known for his ground-breaking heliocentric view of cosmology—the new name is not yet official. Copernicium is the name proposed by the discoverers . . . and that usually becomes the official name unless somebody finds out it means something nasty in some human language somewhere. This eponym thing is interesting. In human anatomy, we are shunning eponyms—in chemistry, it seems to be embraced. Hmmm. And get this . . . Nick Copernicus's name is in fact adopted from the name of element 29, copper (Cu). The name is the Latinized form of Mikołaj Kopernik—his surname having been based on his family's business (copper work). So tuck that away in your trivia file, eh? The research suggests that besides its well-known effects on calcium absorption, vitamin D may also affect many types of cell functions throughout the body. There's a new FREE video available from one of my favorite medical/anatomical animation producers Nucleus Medical Art. Even if you don't care to discuss the herniation aspect, it's a nice animation showing the location and basic structure of an intervertebral disc. Check out the other videos from Nucleus, many of which you might be able to use in your A&P course.